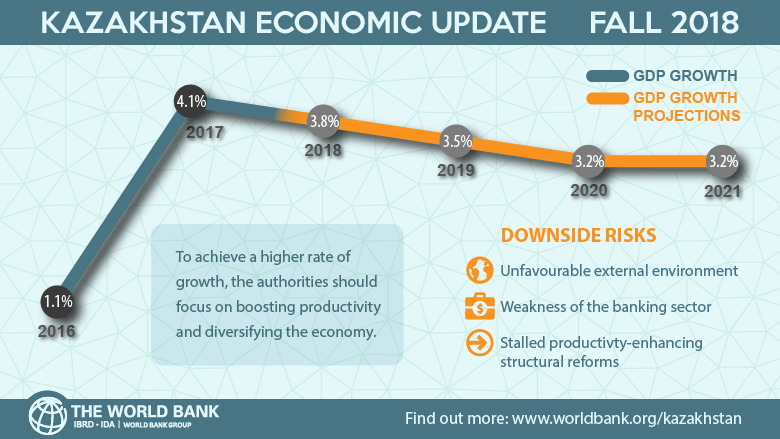 ASTANA (World Bank press service) — Kazakhstan’s real gross domestic product (GDP) growth is projected at 3.8% for 2018 — down from 4.1% in 2017 — and to stabilize at around 3% in the medium term, according to the World Bank’s latest Kazakhstan Economic Update. Supported by robust oil production, the economy expanded at an annual rate of 4.1% in the first half of 2018, down slightly from a growth rate of 4.3% for the same period in 2017. The decline in productivity is attributed largely to constraints imposed on private sector development, as reflected in low rates of business entry. In Kazakhstan, a handful of players—mostly state-owned enterprises - dominate key product markets. Empirical evidence suggests that newer, smaller firms are more productive than older, larger firms. However, because of the continued protection of inefficient, large firms, the exit of less productive firms is not taking place. This suggests that critical elements of Kazakhstan’s economic transition remain incomplete.